In article perspective ways of manufacturing casting from chromic and aluminium cast-iron with special properties are considered. The new way of modifying of a microstructure chromic cast-iron is offered. Change of a microstructure and properties of chromic cast-iron is shown at processing by the complex modifier. The way of production casting from aluminium cast-iron with nodular graphite with prototyping application is considered. The new modifier on the basis of ultradisperse graphite with matrix filler is offered. Key words: chromium cast-iron, aluminium cast-iron, synthetic cast-iron, modifying, out-offurnace processing, microstructure, fullerenes, carbides, prototyping, graphite. Based on theoretical and experimental investigations, the mechanism of formation of cast structure of vermicular graphite irons (VGI) is discussed. The proposed concept of formation of cast structure of VGI is based on the fact that the shape of crystallizing graphite during iron solidification is determined by the physical-andchemical properties of the melt, and the type of metallic base (MB), other conditions being equal, is determined by the chemical composition of the melt, amount of Si being added during the graphitizing inoculation, and the degree of Si liquation in the austenite of the solidified iron. Key words: cast iron, castings, vermicular graphite, structure, properties, alloy state diagrams. Newly developed iron casting methods, equipment and tooling are reported: continuous cyclic casting with directional solidification and horizontal continuous casting of billet sections. Advantages of each method are given. Key words: casting, solidification, structure, casting defects, wear resistance. Results of investigating the influence of chemical composition and crystallization conditions of an alloy, as well as proper casting feeding on the structure, mechanical and service properties of castings made of complexly alloyed irons are presented. Key words: casting, crystallization, structure, wear resistance, hardness. Specialists at the Swedish Research Institute Swerea SWECAST have developed a new coal dust substitute to be used in iron casting in bentonite-bonded sand molds. The amount of environment pollution with volatile organic compounds (VOC) is reduced by up to 90%. NAYVOC* has already been used in the foundry industry for over a year with excellent results, including in automatic molding lines in the automotive industry. Key words: burn-on preventing carbon-containing material, sand mold. A new restructuring concept for low production volume foundry shops - with a capacity of 500 to 3000 tons of castings per year- based on two advanced casting processes: expanded pattern casting (EPC) and using V-process has been developed. Those processes allow to considerably expand a foundry shop's capabilities, ensuring high casting quality. 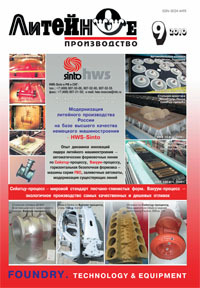 A performed analysis showed that the costs of creating such production facility are 2-3 times lower than those of installing modern molding and core-making machines, sand preparation equipment. The payback period will not exceed 2-3 years. Key words: v-process - vacuum-film molding; EPC - expanded pattern casting; foundry shops; foundry industry; restructuring; precision casting; new concept; high casting quality. In this article a design and research of processes of crystallization s of motor-car pistons is, by the program of the automated design of LVM Flow, with the purpose of modernization of technology of making piston of engine. Giving to centrifugal-cast preparations of the set properties on section is the important problem of modern metallurgy. This problem can be solved by introduction in liquid metal and distributions on volume of received preparation of firm phases of carbides. In the manuscript the mathematical model is resulted, allowing to predict distribution of entered particles on section of received preparation at any moment its crystallisation by means of construction graphic representations.